Reading, PA – January 9, 2019: Good Life Financial Advisors announces its partnership with Riverfront Credit Union as their exclusive wealth management team. 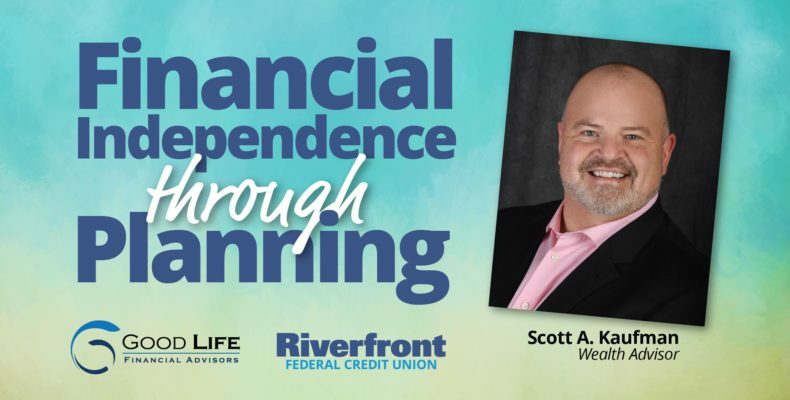 On January 14, 2019, the more than 21,000 Riverfront Credit Union members will benefit from financial planning and investment advice from Scott Kaufman Good Life Financial Advisors Wealth Manager. Good Life Financial Advisors broker-dealer is LPL which currently is the largest provider of third-party investment services to banks and credit unions. Kaufman, who has more than 30 years of financial planning experience, will have office hours at the Riverfront Credit Union Wyomissing branch 2001 Museum Road, Wyomissing on Tuesdays between 10am-2pm and the Reading branch 430 S. 4th St., Reading on Thursdays between 10am-2pm. Kaufman will also be available by appointment to accommodate client schedules outside office hours at the Good Life Financial Advisors national headquarters 2395 Lancaster Pike, Reading. “We surveyed our member base in recent years to see what new product and service offering they wanted to see us offer. In the feedback, they asked for investment advice and services. Armed with this information, Riverfront thoroughly vetted local advisors. At Riverfront, we seek to put each of our members on a better financial path regardless of how much money they have to invest or capacity to borrow. We are committed to strengthening our community by educating our members and assisting them in meeting their current and future financial needs. Good Life mimics this philosophy as well. Their team is down to earth, inviting and committed to Berks County and its residents,” said Jamie B. Denunzio, PHR/SHRM-CP, Chief Operating Officer Riverfront Federal Credit Union. “I am enthusiastically looking towards building rewarding relationships with both the staff and members of Riverfront FCU. Both organizations have similar core values and focus on providing a client experience that exceeds expectations. We both work towards developing long-term and meaningful relationships with our clients and focus on service as opposed to sales. My mission is to help clients work towards financial independence through planning and the Riverfront partnership allows me to be a valuable resource to their members,” said Scott Kaufman Wealth Manager Good Life Financial Advisors. “The community-first values and priorities that have defined Riverfront for years are very much in alignment with the Good Life initiative here in Berks. We are excited that between both organizations clients, thousands of Berks Countians now have access to great banking products and services coupled with financial planning, investment capabilities, and insurance products. Berks Countians, utilizing these two firms, no longer need to leave the county or see their business at firms headquartered outside of Berks. All their financial needs can be served by companies headquartered here. These organizations are built by Berks County residents, for Berks County residents and we are grateful for the partnership,” said Conor Delaney Founder of Good Life Financial Advisors. “We are excited about this partnership. Our values as organizations very much align in how we conduct business and are community focused. This partnership equally allows us to leverage Riverfront’s services to round out our holistic offering to our existing client base,” said Courtnie Nein Co-Founder of Good Life Financial Advisors. Good Life Financial Advisors started in 2012 as a means to provide independent objective advice to families, individuals, and businesses in Berks County and beyond. Founder Conor Delaney and Co-Founder Courtnie Nein have since developed a national footprint with advisors located all around the country serving the needs of Middle America. Conor and Courtnie are relationship-centric and have a core focus on developing strategic financial plans with each of their clients. With access to independent advice, a combined 20-plus years of industry experience, and an energetic team, Good Life Financial Advisors remains one of the premier financial advisory firms in the area.